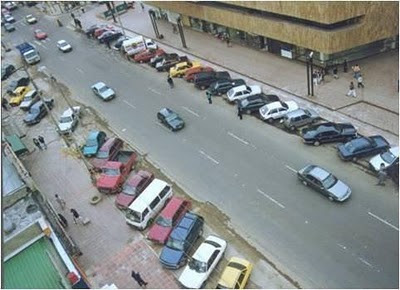 This is the first of a guest series on parking policy in Bogotá by Carlosfelipe Pardo of Slow Research (site in Spanish). Update: The second post in this series is here. Much has been said about Enrique Peñalosa’s “urban revolution” when he was mayor of Bogotá, Colombia during 1998-2000. It is well known that he developed the world-renowned BRT system TransMilenio. It is also well known that he developed an aggressive agenda of public space recovery, sidewalk building and cycleway construction. However, little is known about the parking revolution that his administration also started. This series of posts will describe parking achievements and decisions in that era and since then. Today’s post focuses on key parking changes under Peñalosa himself. 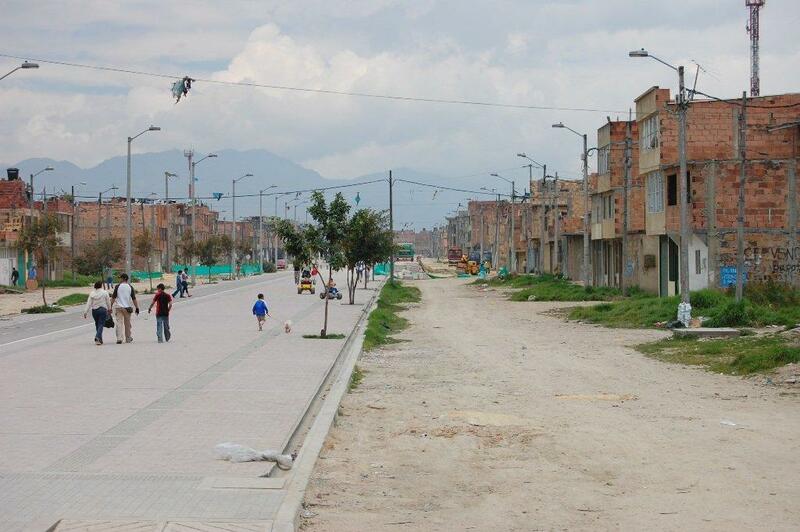 Enrique Peñalosa’s main goal during his mandate was to generate equity in the use of public space. He saw that automobiles were taking away almost all space from pedestrians and other public space users, so he sought to recover as much space as possible for people, taking it away from cars. He also recovered space that had been illegally occupied by vendors, street hawkers, and even formal condos around the entire city. When a road was to be built in any neighborhood, he would build a wider and higher-quality sidewalk with the same money (the message was: if money is not enough, spend it on pedestrians). These efforts resulted in 77,764 square meters of public space recovery, and 863,143 square meters of newly built public space during the 3-years of his mandate. An even more aggressive and contested method of recovering public space was to reclaim on-street parking space. Even though many citizens were complaining about the invasion of sidewalks and public space by parked cars, it was incredibly difficult to implement such a policy. In fact, at one point Peñalosa was at risk of being impeached, primarily due to anger from shop owners along important avenues of the city. However, the administration went ahead and implemented his policy. 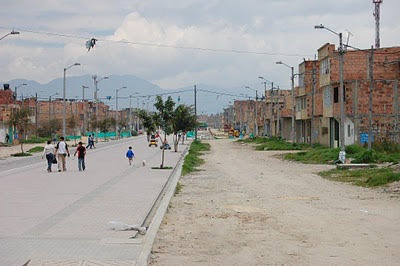 The best example of this policy in action was on Carrera 15, an avenue in Bogotá in a high income area of approximately 5 kms length. Through this avenue there are various shops and office buildings, and some residential buildings. 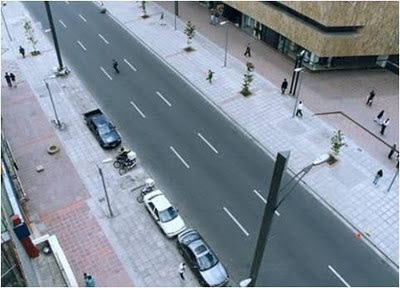 The situation in Carrera 15 was appalling (see photo above): more than five thousand free parking spaces were available to anyone who would arrive at a shop, while bad quality or no space was given to pedestrians along the same sidewalks. Shop owners did not see a problem with this situation, and felt greatly threatened by Peñalosa’s project to remove parking spaces and build wide sidewalks. However, the local construction agency (IDU) did a survey which found that 80% of the vehicles parked outside shops were actually owned by shop owners and employees! Only 20% were of spaces were serving their clients. Furthermore, it was found that in some areas there was actually an oversupply of almost three times the actual parking space use (e.g. 166 cars parked in an area that had a total of 479 parking spaces). The Mayor was emboldened and the project went ahead. The results are shown in the photo below. No urban project can be perfect. Peñalosa’s on-street parking reforms were bold and effective. His main goal had been to transfer on-street parking spaces to off-street parking lots and this was successful. In line with this he also decided to offer tax incentives (discounts) to those who were interested in developing off-street parking lots. Many private companies took this opportunity to build a large number of off-street parking lots. Unfortunately, the Mayor may have been too generous in encouraging off-street supply! In this he did not follow his own rhetoric which claimed that parking was a private matter to be paid for entirely by its private beneficiaries. The shift away from free on-street parking to paid off-street parking was an important change for the city. However, time would present other challenges. Look out for further posts in this Bogotá series. Interesting. Can you quantify how these changes in parking affected pedestrian, cyclist and motorist activity? I imagine this might be difficult since other policies were implemented simultaneously, but how about just with arrival mode to shops on transformed streets such as Carrera 15? (Were the above photos taken at the same time of day/season?). Also curious if this resulted in more expensive parking, and how the results of the policy look these days and if people still support them. We once did a small survey of how these actions improved shop activity and had nice information, but it wasn't very rigorous to extrapolate to all the city. The photos are not necessarily taken at the same time of day or season. 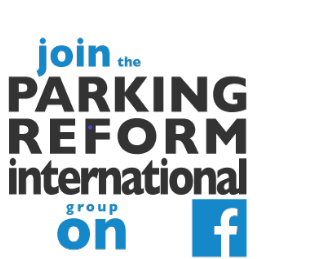 The following blog posts on this topic will describe how the parking pricing and supply changed, so stay tuned! Fascinating stuff. I gave some training to a few colleagues from Bogota just last week and we discussed the super high curbs to prevent parking around parque de 93 (and other places as well). The issue of automobiles encroaching onto already scarce public spaces is extremely important. Fantástico artículo CF...me queda la duda, como resultado si la resolución del problema por parte del mercado, esto es, llevando la oferta a espacios privados (modelo city parking) se genera una disminución de la demanda en función del precio o solo se cambia el problema de lugar? The invasion of sidewalks by cars was definitely reduced with Penalosa. Unfortunately, there was a terrible side effect. People started to demolish beautiful historic houses to construct off-street parking, commiting architectural crimes. Subsidies should have gone only for elevated parking garages, if at all. I would also say that Penalosa went too far and demonized all street parking, not just sidewalk parking,even in areas with plenty of space. This led to the proliferation of parking lots. He could have established a sensible parking meter system, making it reasonably expensive but not banning it completely. You shall wait until my next post on this issue to get feedback! But anonymous's comment is "spot on". Es hora de un seminario para socializar este articulo y el excelente informe de la gtz.